The Epcot International Food and Wine Festival taking place from September 28-November 12, 2012 at the Walt Disney World Resort. The festival is a fan favorite event happening every fall that highlights food and beverages from around the world. From special seminars and tastings, to entertainment classes hosted by HGTV personalities, Amongst the highlights of this year’s festival will 29 Market Place Booths dotted around the 1.2 Mile World Showcase Promenade that feature regional dishes and beverages from around the world. Marketplace Booths will each feature a specific cuisine related to the country that it represents and offer guests a menu of tapas sized plates all between $3-$8. In addition to the food selections each booth will feature regional beers, wines and cocktails that compliment the small plates. On the menus guests will find some of the favorite dishes from years gone by, in addition to 12 brand new dishes and a few familiar ones that have been reimagined with a new twist! New this year is the Terra Booth that will feature flavorful vegan cuisine, and the Florida Booth showcasing locally grown and produced food. There will be abundant opportunities to snack and sip your way around the promenade while visiting the 29 Marketplace Booths and 11 World Showcase pavilions. Our good friends over at the Disney Food Blog have all the up to date information you need to get the most out of your Food and Wine Festival Trip. Stop by their site for a full listing of the Marketplace Booth Menus and lots of food pictures too! 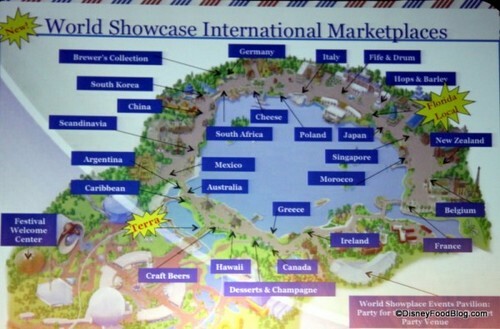 We want to thank them for giving us exclusive use of the Marketplace Booth Map Image. Do you consider yourself a foodie? If so, this is the most fabulous time of your for you to vacation at the Walt Disney World Resort. What are you waiting for? This entry was posted on Monday, August 6th, 2012 at 3:13 pm	and is filed under Dining, Planning. You can follow any responses to this entry through the RSS 2.0 feed. You can leave a response, or trackback from your own site.